Terrorist Commander Killed in Clashes between Rival Groups in Northern Aleppo 5 out of 5 based on 3 ratings. 3 user reviews. Othman Saleh, a senior commander of the Free Syrian Army (FSA), was killed during clashes with Turkmen rival terrorist groups near Jarablus. Clashes between the Free Syrian Army (FSA) and Turkmen rival terrorist groups near Jarablus, located near Syrian border with Turkey, claimed the life of a senior commander of the FSA, Othman Saleh. Saleh was the commander of the Soqour al-Jabal brigade of the FSA. Earlier this month, an intense infighting between three Syrian terrorist groups was disclosed by unnamed battlefield sources if the Fars news agency. As the sources reported, differences between terrorist groups, in particular between the Jaish al-Hor, the Jaish al-Fatah and the Jaish al-Mojahedeen, increased in southern Aleppo, as they accuse each other of betrayal. “The reason of their intensified differences is that certain groups, affiliated to the Jaish al-Hor, left their comrades, members of the Jaish al-Fatah, during the clashes with the Syrian Army and the National Defense Forces [NDF], and fled the battlefield,” the sources explained. Infighting between rival terrorist groups has increased, after the Syrian Army besieged the area, as well as recaptured vast parts of lands throughout the country, especially in Aleppo. 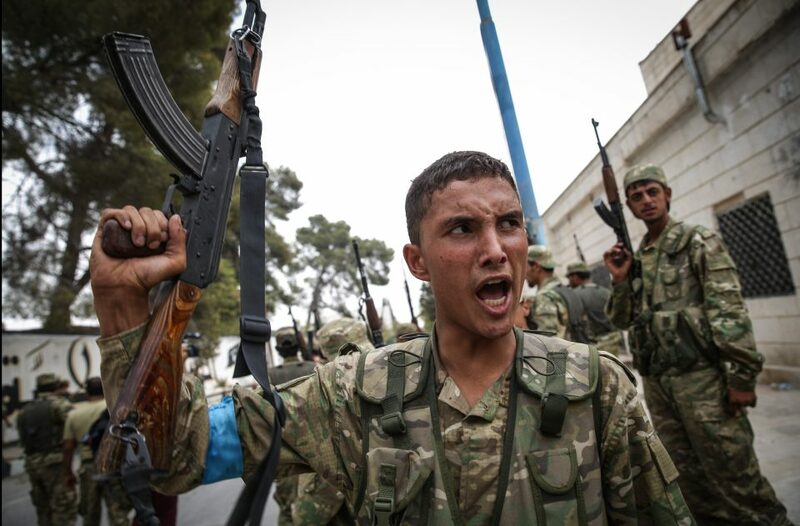 The infighting was started last month by heavy fighting between the Islamic State (IS) terrorist group and its rivals from the Jaish al-Tahrir and the al-Shamiyeh Front in the northern parts of the province of Aleppo. Defense lines of the Jaish al-Tahrir and the al-Shamiyeh Front groups were stormed by the IS near al-Rai, as well as the town was recaptured by the group. Both sides suffered heavy losses in the clashes.